We regret to report the death of Jean Blair, who died on 29 November 2016, aged 94. Miss Jean Blair sadly passed away on the 29th November 2016, at the Check House Nusing Home, in Seaton, Devon, age 94. 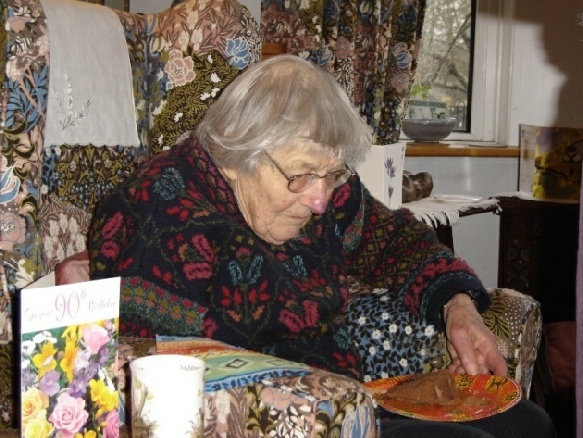 Prior to moving to Devon, Jean Blair was living in Farnham, where she celebrated her 90th bithday. The photograph shown here was sent to your Editors by Jane Gates (ex-FGGS). Miss Blair taught art and also took a class in italic writing at the Girls' Grammar School, before joining Farnham College working alongside the Boys’ art master John Wills. which has been posted on Blunderbuss.